So I stuffed up last week and wrote that I was going to be reviewing 70410: Soldier’s Outpost, but I’ve already done that one! I was meant to say 70412: Soldiers Fort! It’s bigger, with some pretty great minifigures and some fun play elements. 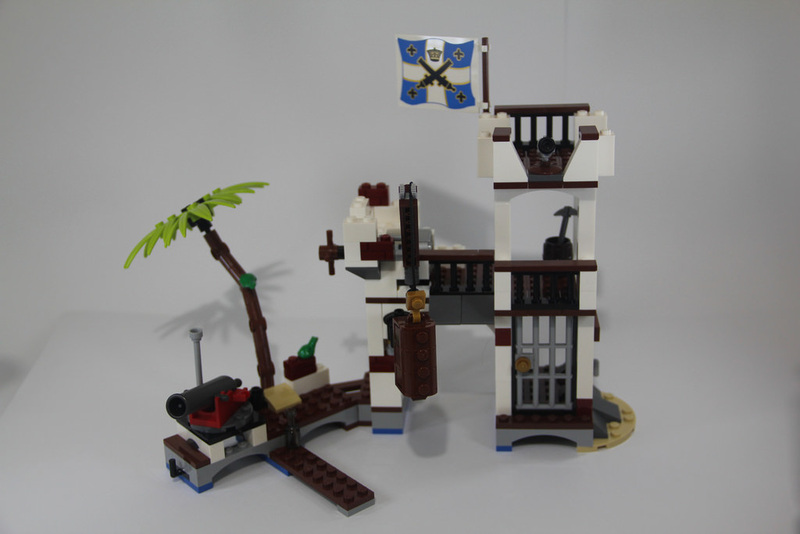 It’s been a long time since I’ve done any of the 2015 Pirates sets, but now that I’ve finished my Pirates layout called The Battle of Bluecoat Bay, it was a good time to review the last sets. 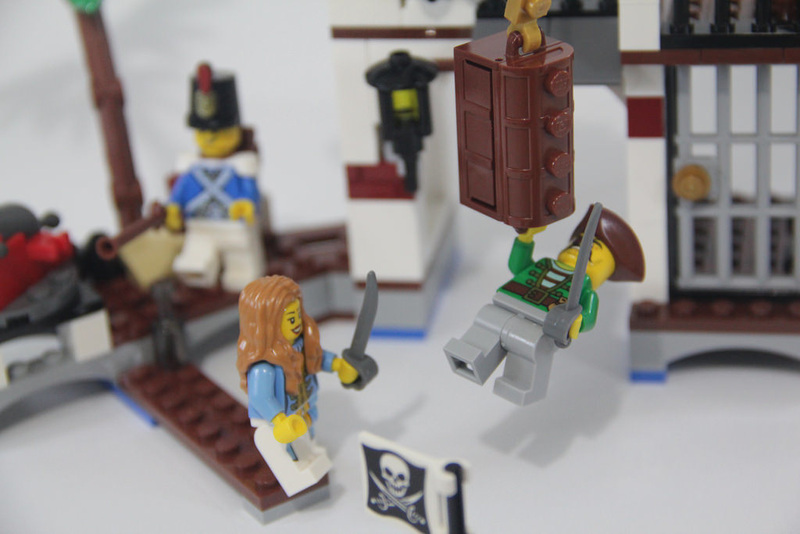 The big drawcard for me with the new Pirates sets has been the new design of minifigures. They’re full of brilliant details, and bring out just as much excitement as they did when the Pirates set was first released in 1989. 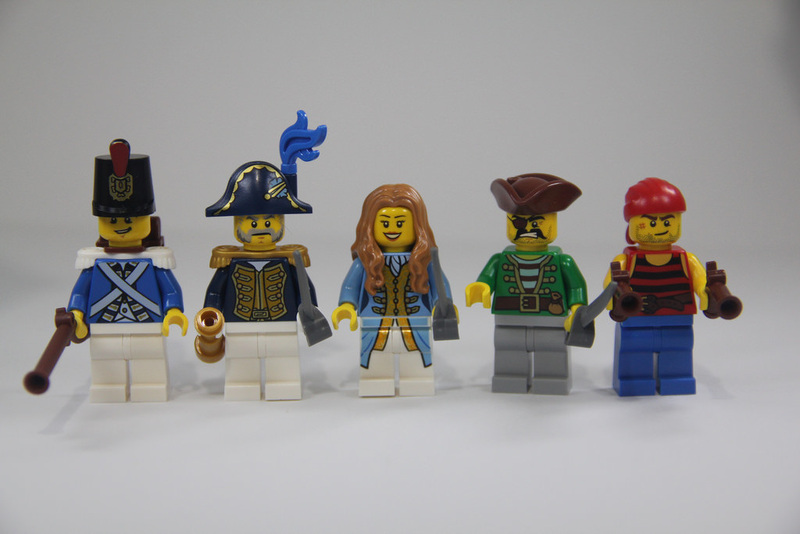 This set has five brilliant minifigures, one of which is unique to this set – the Governor’s Daughter. There’s also the Governor, in all his finery, a regular Bluecoat soldier, and two pirates. I love how even the simplest pirates still look fantastic. Each of the minifigures (and there’s a fair few for a set this size) have beautifully printed torsos front and back, and with the female, there’s also printing on the legs. The hair for her is also quite hard to come by, having only been seen on the Elizabeth Swann minifig from 4181: Isla de la Muerta. 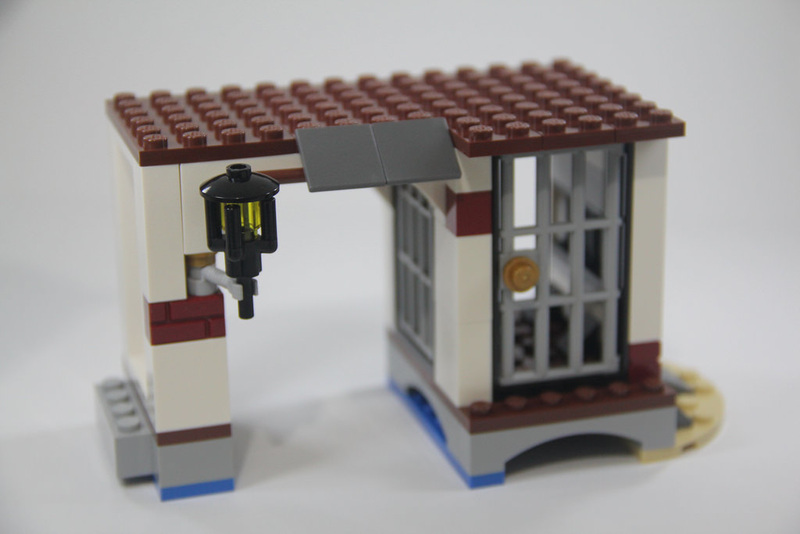 Not counting the minifigures, there’s some nice parts, although not many for a set that cost $45. a handful of 1×2 profile bricks in the new dark red, a 30M length of string, arches, pillars, jail frames, fences, a big Bluecoat flag and a couple of frogs to name a few. It’s not a set known for it’s great inclusions, but it’s still okay. The palm leaves are beautiful. I’ve really been a fan of the trees in this Pirates run. 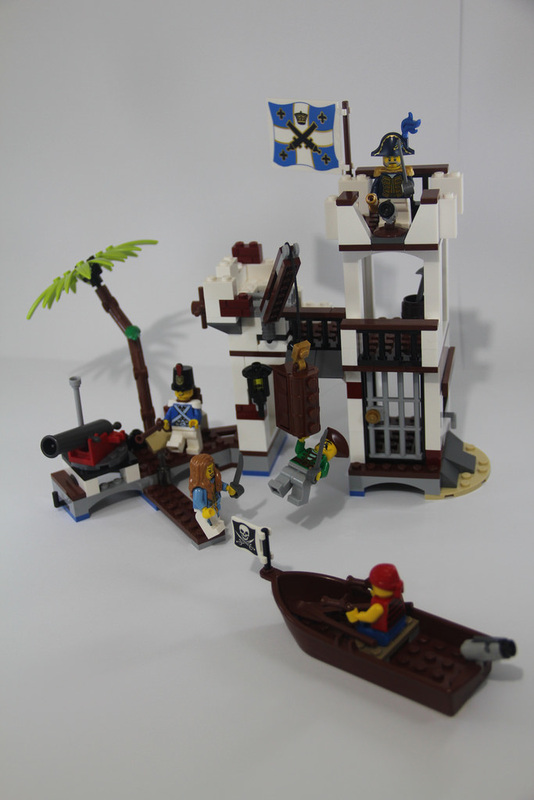 There’s a good amount of play to this set, with the jail, cannons, boat, and of course the treasure and winch. I’d imagine kids would have a lot of fun playing with this set, and it would only increase with the other sets combined. I know I had a lot of fun laying out Bluecoat Bay! There’s also a removable wall in the jail, but there’s also a big open space at the back, so it’s a little pointless. 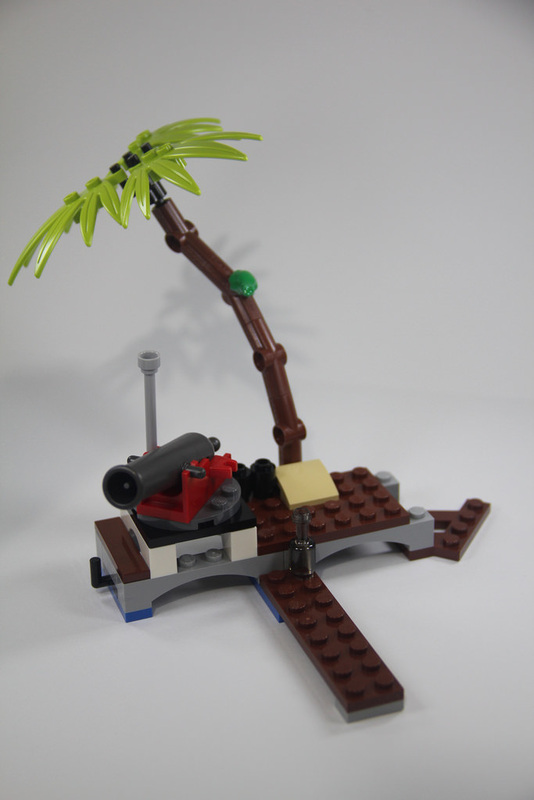 You start with the jetty and tree. It comes together quickly and easily. I still love the trees, they’re simple, and beautiful. Next is the bottom half of the fort, that houses the jail. Again, very simple, with one brick on top of another. These get joined together, for the base of the fort. Finally comes the top half, with the winch. 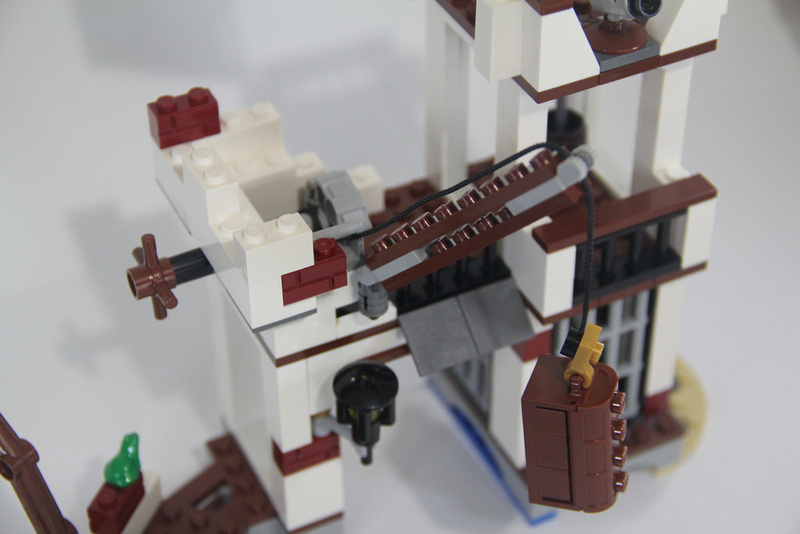 It’s quite simple to build, and that’s the most technical part of the set. Simple, but effective. I’m honestly a little bummed out by this set. It’s meant to be the big fort, and yet it’s tiny, and completely open at the back. Sure, it looks nice from the side, but this set to me is saying “You need to buy the rest of the 2015 theme to go with me”, and that’s also indicated on the box. It’s a clever marketing strategy from LEGO, but was it worth it? One well aimed cannonball from the Pirates would send this crumbling in a heap! I do like the white and maroon contrast. It really does make it look a bit worn, and the way they’ve hidden the winch is quite good, but it’s still lacking substance. 70412 will still set you back around $40 for a copy, whether that’s new or used, as it’s only retired recently, and wasn’t a hugely in demand set. It still works out to be less than 20 cents per part, but the parts aren’t that great. Yes, it’s marginally cheaper than the RRP, but it’s still not a huge saving. I’m happy that I got it, but purely for the minifigures and the odd part here and there. Unless you’re a massive Pirates fan or after the complete 2015 range, it’s not a hugely collectible item. The Governor’s Daughter bumps it up a bit, but it’s not overly collectible, unfortunately. It will still be extremely popular, but that might just be because of the Pirates tag. Not a huge rating overall, but still a fun one to build, and one that kids will most likely enjoy. 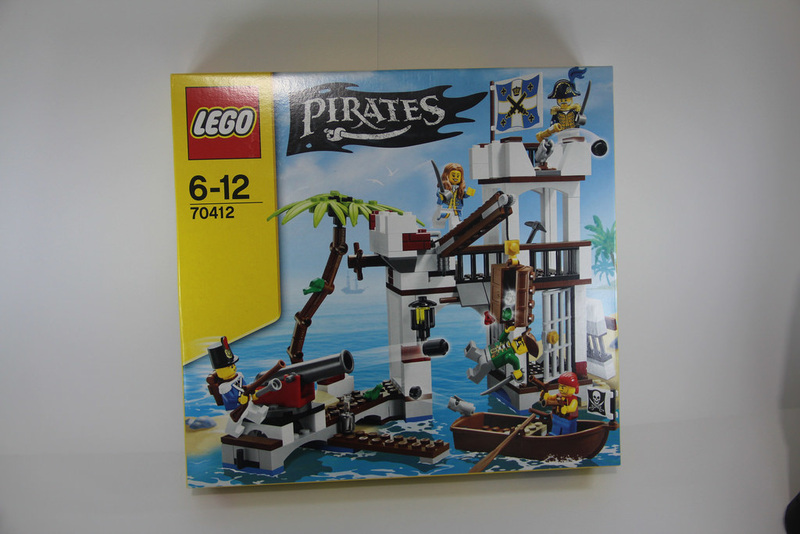 Next week I’ll be staying with the Pirates theme and looking at 70411: Treasure Island. ​What do you think? Did I get it completely wrong? Let me know in the comments.